Explore China from the Inside today. Investigate the real issues in modern China with clips from the documentary series woven with activities that lead students on an examination of Globalization (Lesson Plan 1) and Environment & Development (Lesson Plan 2). Students at a school for disabled children in Shandong province. China from the Inside classroom activities are designed to cover 1-2 class periods for high school and college students (grades 9-16). They can also be customized or adapted to your particular classroom and grade level. The activities are tied to the following Academic Standards set by the National Council for Economic Education (at ncee.net). 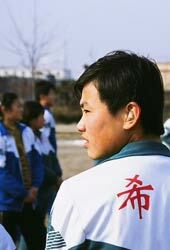 Additional Teaching Resources on China is a list of web resources, educational institutions, and films about China. PBS Teachers has more than 4,000 free lesson plans and activities as well as online professional development opportunities for teachers. You may record China from the Inside off-air (see TV Schedule for broadcast times in your area) and use the program in the classroom for one year from the date of broadcast. If you miss a program or if your one-year taping rights have expired, you can purchase the program from ShopPBS.com.